Spurlington is a small community 8 miles north of Campbellsville. It began as a small settlement of farmers in the 1840's, while Taylor County was still a part of Green County. Taylor County was created in 1848 and shortly after, work on the rail-line began. A 31 mile rail-line from Greensburg to Lebanon was created and with the creation came the Spurlington Tunnel. It took 7 years to build...historians say that the construction date was March 1,1867, and was completed on July 1,1874. The tunnel excavation was mostly blue limestone with a ledge of black flint. It took the average force of 75 men, 24 hours to go 6 feet into the rock. The tunnel is 1900 feet long with a 100 foot shaft hole carved out of the middle so the exhaust from the train could be realeased from the tunnel. 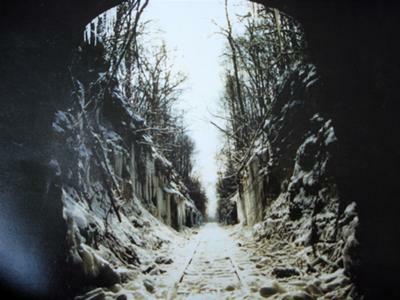 The first train came through the tunnel in October of 1879, There were four trains a day to use the rail-system. The train carried passengers and shipments of freight to Taylor and Green Counties. For more than 100 years the legend of a witch has hovered over the Spurlington Tunnel and her name is Nancy Bass. Bass, who lived in the small community of Spurlington in the last century is thought to be buried on top of the train tunnel. People claim "Aunt Nancy" as some called her, may have been related to several prominant families in the settlement had witnessed a group of robbers led by notorious Jessie James were digging a hole to hide some stolen silver and gold that had been taken in a train robbery that occurred in the Cumberland Mountains. The men noticed that Bass was being a witness to a crime so the James gang robbers killed Bass, burying her body with the treasure somewhere on top of the tunnel,there are no grave markers. Legend says that Bass has haunted the tunnel and put a curse on anyone who tried to dig up the treasure. Some still think that the James Gang loot is buried in the vicinity of the tunnel. And, in years past, treasure hunters pitted the ground searching for the alleged fortune. The photo used on this page is my pic that I took in the 80's and you guys never ask my permission!!! My dad lived on the property and went in and out alot. can you tell me how to get to the tunnel? I would love to visit it. I have been through that tunnel many times in my twenties. Thank goodness there was never a train, or I would be dead. It is pitch black in there from all the train sute . And the big hole in the middle of the tunnel is neat you look up an see trees an the skies. There was a poor ground hog who fell through the top an landed on the tracks. We all joked he committed suicide. Lol if you go about a mile out of the tunnel on the other side you come to a trussel, you look down about five hundred feet an there is a farm an you see these cow's look so small. The train did still run through there for a while after that, just thankful it didn't while we were in side it.